Renting a building for residential purposes or commercial purposes is tricky. It’s tricky because of the formalities and the restrictions that the landlord imposes on the tenants. Even if the tenant agrees to all the terms, issues happening between the parties are a common view in most cases. 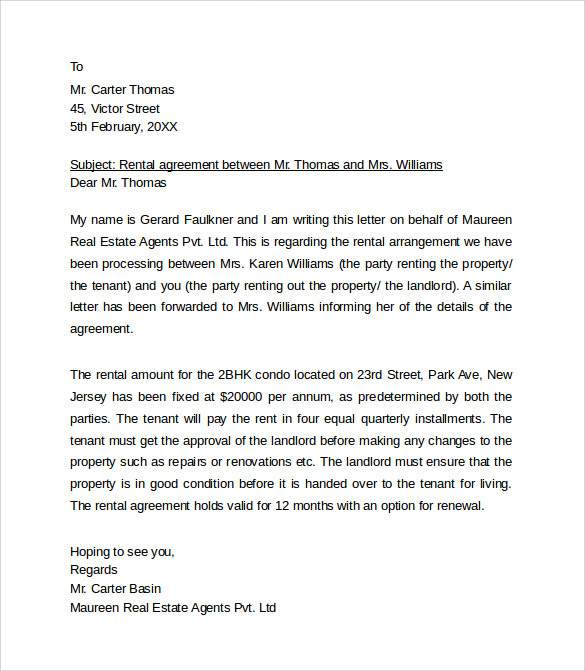 To avoid the same, very clear and well descriptive rental agreement letters are to be drafted. 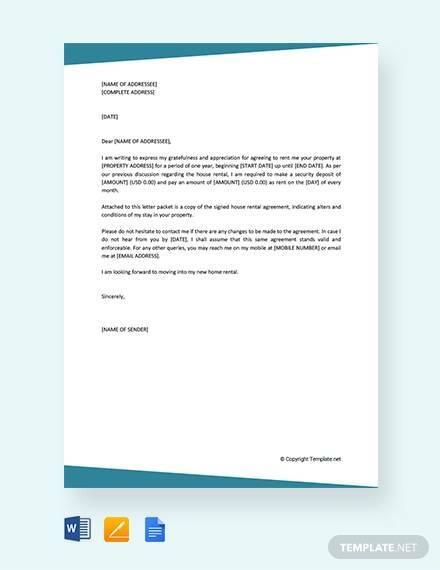 A nicely written, clear rental agreement letter will contain all the conditions and demands of the landlord and the privileges to the tenant. This will help both the parties to have a hassle free rent process. 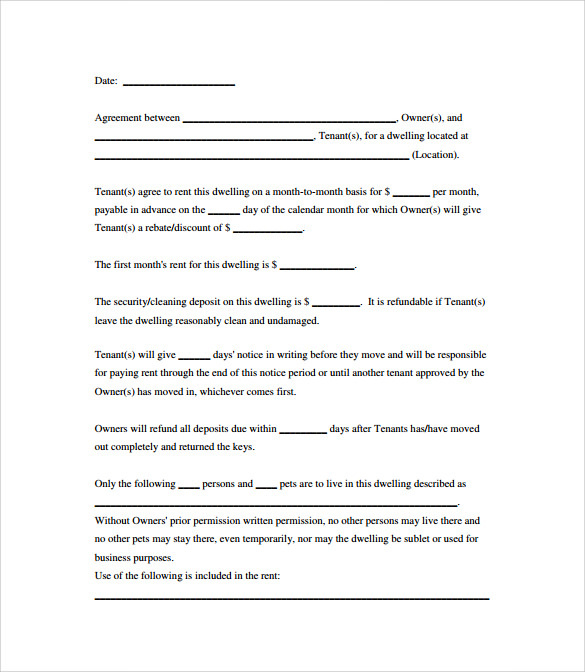 You may also like Home Rental Agreement Templates. 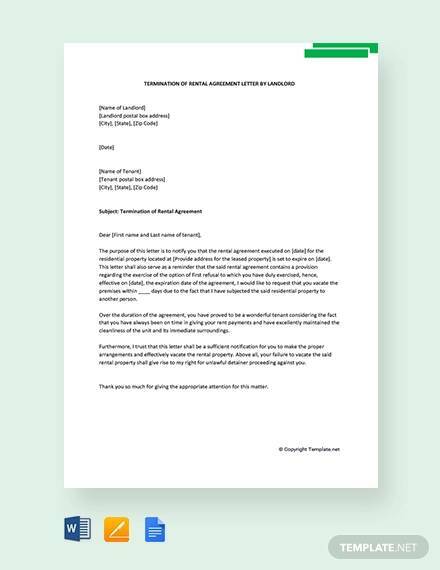 This rental agreement letter is one of the most crystal clear rental agreement letter samples available over the internet. 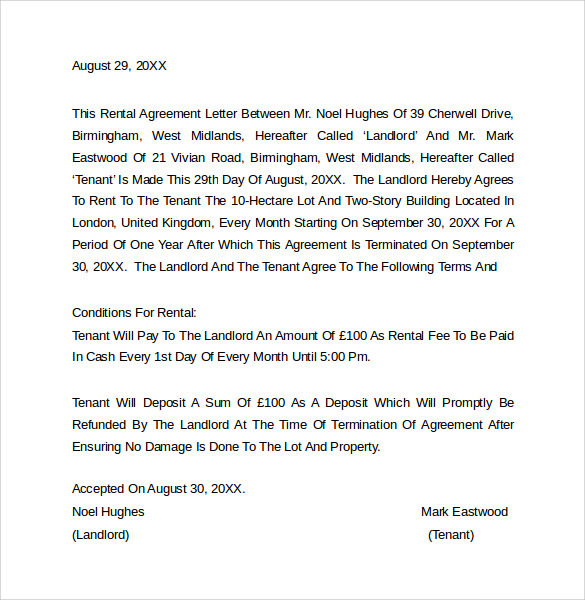 Very clearly describing the details of the landlord and the tenant, the document explains its intention. There is not a point that leaves a doubt in the parties. The letter is short, crisp and obviously very useful. 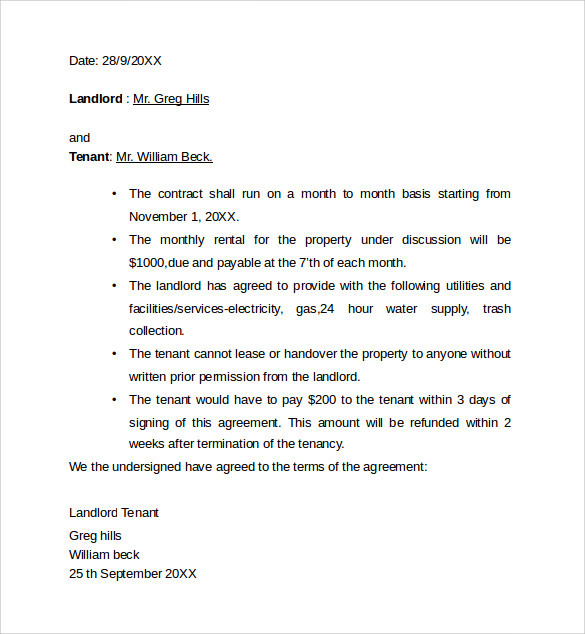 If you are a landlord who would like to impose some conditions over the tenant, and if you would like them to follow the same, you can add it on the rental agreement letter. This sample clearly shows the way in which your preferences shall be included in the agreement in the most polite words. Are you a landlord who is very concerned about the financial transactions? Would you like to inform, the tenants about the rent and the security amount in detail? If you are, then this template will fit you. The template explains the amount, privileges and the party details in short and sweet words. Do you believe in fewer words and more actions? 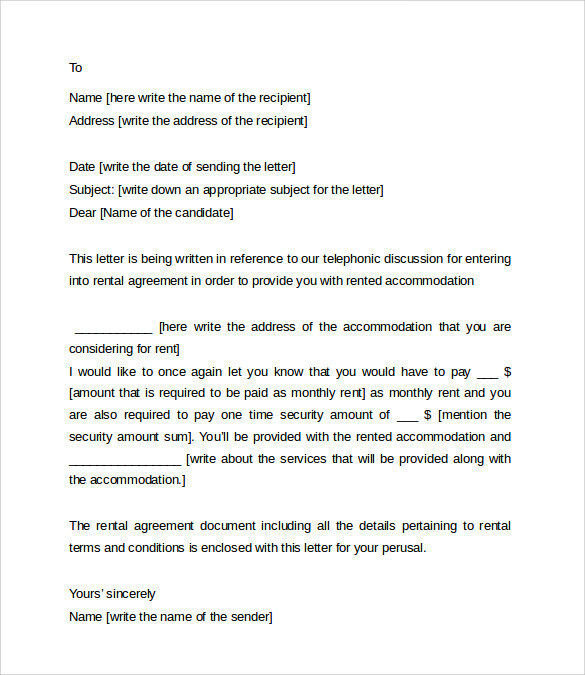 Then this rental agreement letter sample is going to help you. The sample, with a clear and short bullet, pointed details will convey all the preferences. Being listed as bullets, each and every point in the letter will get the notice of the tenant and that will help you in a problem free rental process. Landlord or Tenant, you are Going to get Benefited! 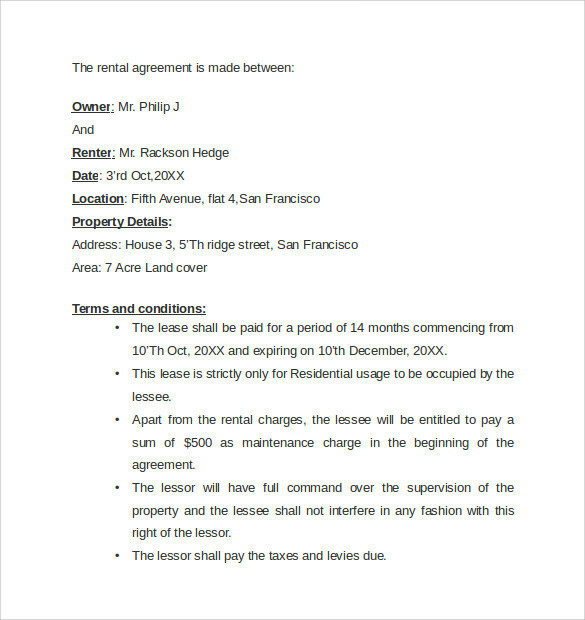 A clear sample of a rental agreement letter will help you to get a stress free rental process for residence or office space. 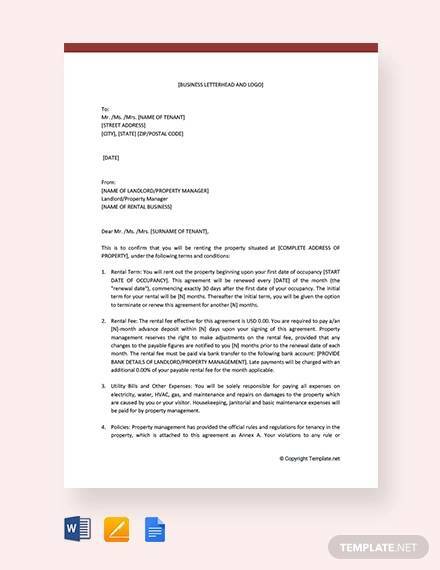 If you are a landlord, this agreement letter will make sure that all your demands have been informed to the tenants as well. A sample will let you create an accurate document and that, in turn, will benefit you while the evacuation of the tenant too. 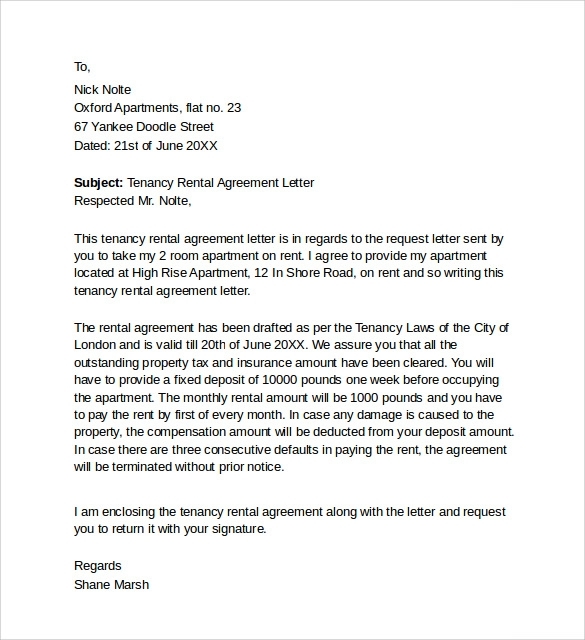 Understanding the structure and content of a rental agreement letter will help you as a tenant. You will not be used up by landlords who imposes unwanted rules on the tenants to get some extra bucks while evacuation. You will be clear about your privileges and your rights over the property. 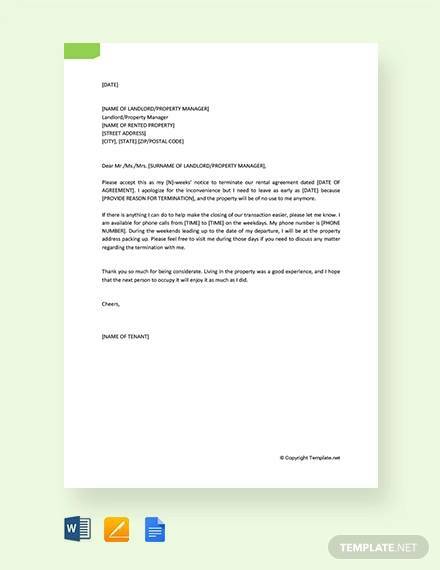 You may also like Manager Reference Letter. A sample rent agreement letter has more than one advantage. It will act as a good reference and it will act as a good model document as well. It will save you a lot of money that you spend to any freelance document writer. These templates will clear your doubts on document creation and will make you a perfect landlord who knows how to draft a rental agreement letter. These samples will make you independent by allowing you to create your own rental documents and thereby will remove the third party interference among you and the tenant. A nice template will give you a chance to modify the same template and to create a fresh one. Having a good rental agreement letter will let you have a hassle-free rental process. It will save the time, effort and resources to create a new draft. This will give a basic understanding of the document process, its contents, structure. 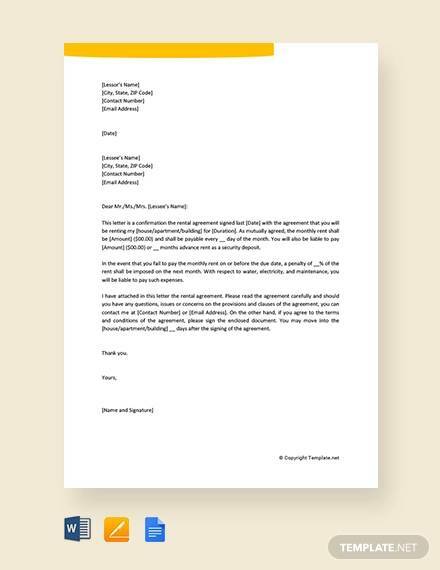 Good samples will create an error free document agreement letter drafting scenario.